9 July 2015 - First Driver Kevin Ceccon and Arden Team dazzled fans in England after an artistic performance in Silverstone Race, showing supremacy from beginning to end, managing the attacks of Mercedes driver Esteban Occon, signing the best lap of the race, and maintaining a winning position under a fashion only seen in true champions. “It is good as we struggled a lot in the first part of this season. After Austria I was hoping to come back even stronger and that’s what happened. (…) Honestly, the team has worked so hard and helped me a lot”, explains Ceccon, Champion of Silverstone Race, 2015. 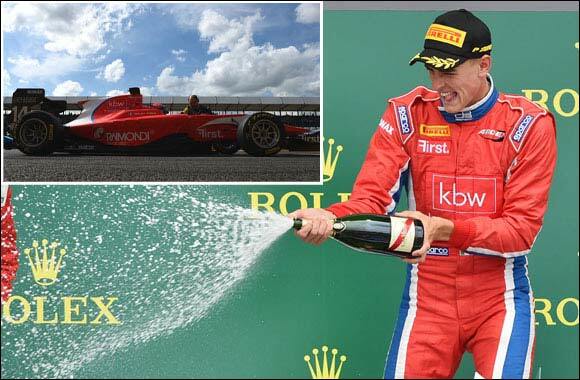 Out of the race tracks, Kevin´s performance can be seen as a result of a well organised effort of multiple players of the value chain to achieve maximum performance, specially Arden Team, Formula Medicine and Sutton Images, with the financial support from KBW Investments and First management. “This has been a result of everyone working hard together and the support that has been provided for the team and Kevin.” Julian Rouse, General Manager of Arden. Out of the tracks, the success is explained by a management philosophy which values systematic processes, risk management and human behavior. Kevin´s performance is measured and improved by specialists from medical science to high level mechanical engineers. “We have lived together high pressure during the past two weeks to get the most out of the champion, but the results are there and we are all very proud. It is amazing.” says Stefano Zuech, Managing Director of Motorsports Division of First. Out of the race tracks, First believes Kevin may serve as an inspiration for startup and early stage companies, and an incentive for executives to strive for the maximum performance when driving companies they manage in the fast changing economic and business environment. “Congratulations to the awesome Kevin Ceccon on an impressive come back.” Prince Khaled Bin Alwaleed, chairman of First.